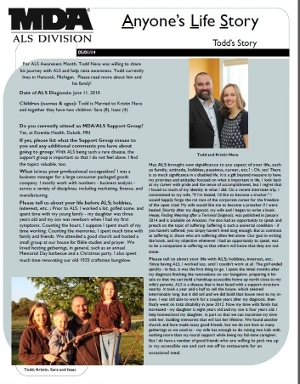 May is ALS awareness month, and for its monthly newsletter, the Muscular Dystrophy Association for Minnesota/Western Wisconsin featured Todd in its Anyone’s Life Story profile. What was your professional occupation? I was a business manager for a large consumer packaged goods company. I mostly work with numbers — business analysis — across a variety of disciplines, including marketing, finance, and manufacturing. Prior to ALS, I worked a lot, golfed some, and spent time with my young family—my daughter was three years old and my son was newborn when I had my first symptoms. Counting the hours, I suppose I spent much of my time working. Counting the memories, I spent much time with family and friends. We attended a good church and hosted a small group at our house for Bible studies and prayer. We loved hosting gatherings, in general, such as an annual Memorial Day barbecue and a Christmas party. I also spent much time renovating our old 1925 craftsman bungalow. Since having ALS, I worked less, until I couldn’t work at all. The golf ended quickly—in fact, it was the first thing to go. I spent the initial months after my diagnosis finishing the renovations on that bungalow, preparing it for sale so that we can build a handicap-accessible home up north close to my wife’s parents. ALS is a disease that is best faced with a support structure nearby. It took a year and a half to sell the house, which seemed interminably long, but it did sell and we did build that house next to my in-laws. I was still able to work for a couple years after my diagnosis, then finally went on total disability in June 2012. Now my time with family has increased—my daughter is eight years old and my son is four years old. I help homeschool my daughter, in part so that we can maximize my time with her, building memories that will last her lifetime. We found another church and have made many good friends, but we do not host as many gatherings as we used to—my wife has enough to do raising two kids with nothing more than my moral support while being my full-time caregiver. But I do have a number of good friends who are willing to pick me up in my accessible van and cart me off to restaurants for an occasional meal. What has been some of your toughest challenges living with ALS? The toughest challenge is change. At any given point, I think to myself, “If it would just stop now, I could deal with it.” But it doesn’t stop. There were more setbacks, month after month, each devastating: unable to comb my hair, unable to button my shirt, unable to pull on my cowboy boots, unable to drive, unable to bathe myself, unable to lift a glass to my mouth, etc. I have very limited use of my hands. I struggle to walk. I fall occasionally. I sleep a lot. I require a personal caregiver for the most basic tasks. But even now, I think, “If it would just stop, I could deal with it.” But it doesn’t stop. ALS is relentless. How have you needed to adapt to enjoy life with ALS? God has given us the most amazing ability to adapt, from the power of our subconscious minds to the gift of geniuses who invent tools. This is what gives me an earthly hope: knowing that I have already adapted to so much, and knowing that other people who progressed much further than I have adapted and found great quality of life. Some of the adaptation is subconscious. As some muscles give out, my mind effortlessly finds new ways to lift, pull, or hold. I don’t think much of it until somebody points out the clever way that I’m eating or drinking or writing. Some adaptation is creative. I have a problem that needs to be solved, and I have to think of a solution, such as ramp or lever. Some adaptation is collaborative. The ALS clinic is an excellent place to find solutions to problems. Some adaptation is technological. There are adaptive programs embedded into every computer, such as the on-screen keyboard and the touch-to-click trackpads on laptops. To write this, I’m using voice-to-text dictation software. Eventually, I will use eye-gaze technology, and may speak using my prerecorded voice. 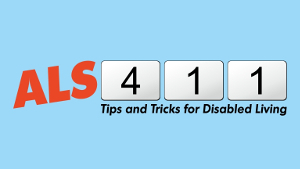 Has ALS brought new significance to any aspect of your life, such as family, attitude, hobbies, passions, career, etc.? There is so much significance in a disabled life. It is a gift beyond measure to have my priorities and attitudes focused on what is important in life. I look back at my career with pride and the sense of accomplishment, but I regret that I put so much of my identity behind what I did. On a recent interstate trip, I commented to my wife, “If I’m healed, I’d like to become a trucker.” I would happily forgo the rat race of the corporate career for the freedom of the open road. My wife would like me to become a preacher if I were healed. Shortly after my diagnosis, my wife and I began to write a book. 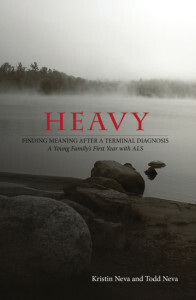 Heavy, Finding Meaning after a Terminal Diagnosis, was published in January 2014 and is available on Amazon. I’ve also had an opportunity to speak and preach on the topic of suffering. Suffering is such a universal condition — if you haven’t suffered, you simply haven’t lived long enough. But as common as suffering is, those who are suffering often feel alone. Our goal in writing the book, and my objective whenever I had an opportunity to speak, was to be a companion in suffering so that others will know that they are not alone. Do you have a favorite quote, song, saying or any “words to live by” that inspire you? Is there anything else about yourself and/or ALS that you want to share with others who read your story? ALS is a dreadful disease, without a doubt, but it is a disease that gives its victims time. Some people are cut down by cancer. Some people die in an instant by heart attacks or auto accidents. Surely there’s no good way to die, but all things considered, I’m glad that I have time. I have time to build memories with my wife and children, ensuring that they know how much they are loved. I have time to get my house in order, financially and spiritually. For some, this disease progresses so rapidly that there is continual stress, but even for them there is time to say goodbye. For others, like myself, this disease progresses slowly, allowing us to find new interests and meaning in a disabled life. It’s not all bad. I pray for a cure, even miraculous healing, but I don’t dwell on it. My days are fairly normal. I wake. I eat. I communicate. I laugh. I sleep. I have many interests and find things to keep myself busy. I am not dying of ALS. I am living with it. This entry was posted in Uncategorized on May 30, 2014 by kdneva. There was something noticeably absent at the ALS clinic: Kristin crying. The main reason for that was the news of my breathing. I scored 92% on forced vital capacity. FVC is a measurement of how much air I can expel from my lungs. As my diaphragm weakens, I lose the ability to expel carbon dioxide. Breathing is critical for obvious reasons, but this measurement is important because it determines when intervention is required. Surgery for a feeding tube, for example, requires that my breathing is at least 50%. At my first ALS clinic, my breathing was 104%. Six months ago it was 90%. Kristin was bracing for 87%, but when I blew a 92%, Kristin smiled. Before the clinic, last Tuesday, April 22, we had an opportunity to speak at an ALS support group. There were three other couples in attendance. It was difficult to know what to say to them. We’ve spoken to other groups, but the folks at the support group are in the ALS trenches with us, and in some ways have suffered more as their disease progression has been faster. I was cognizant that it was nearly four years to the day of my first appointment at the spine care clinic when the neurologist saw the atrophy in my left arm and ordered an MRI. Four years is a long time to survive with this disease. What do we tell these folks about suffering? We tell them that it’s okay to grieve. After an ALS diagnosis, we need to grieve, and not worry about where it’s going to take us. Grief is a process, not just an emotion. Grieving is something that we need to do, something that requires action. One of those actions is that, eventually, we need to gain perspective, that life is out of our control and the only thing we can control is a response. We tell them that one of the perspectives that can be gained is that we have the blessing of time. Kristin told them that the only thing that we can control is our response. 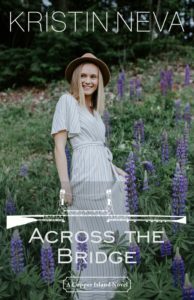 Kristin encouraged them to keep seeking God, even in anger and sadness. And finally, I talked about having purpose, how there is significance in a disabled life. This entry was posted in Uncategorized on May 1, 2014 by Todd Neva.